U.S. President Donald Trump said that he holds Venezuela's President Nicolas Maduro personally responsible for the health and safety of two of the country's leading opposition figures, taken from their homes in the middle of the night by state security agents. U.S. President Donald Trump said in a statement late Tuesday that he holds Venezuela's President Nicolas Maduro personally responsible for the health and safety of two of the country's leading opposition figures who were taken from their homes in the middle of the night by state security agents. "The United States condemns the actions of the Maduro dictatorship," Trump said in a written statement released by the White House. The statement says Leopoldo Lopez and Antonio Ledezma are "political prisoners being held illegally by the regime." Earlier Tuesday U.S. Secretary of State Rex Tillerson said it's "very alarming" that two of Venezuela's leading opposition figures were taken from their homes in the middle of the night by state security agents. "We call for their immediate release," State Department spokesperson Heather Nauert told reporters Tuesday. Canada's Foreign Affairs Minister Chrystia Freeland echoed the U.S. position. "We call for their immediate release," she said in a statement. "Canada is gravely alarmed by the unlawful detention of Venezuelan opposition leaders Antonio Ledezma and Leopoldo Lopez." Freeland said. "Their detention is further proof of the regime's dictatorial intentions." Lopez's wife posted what appeared to be video of him being taken from their home after midnight Tuesday. 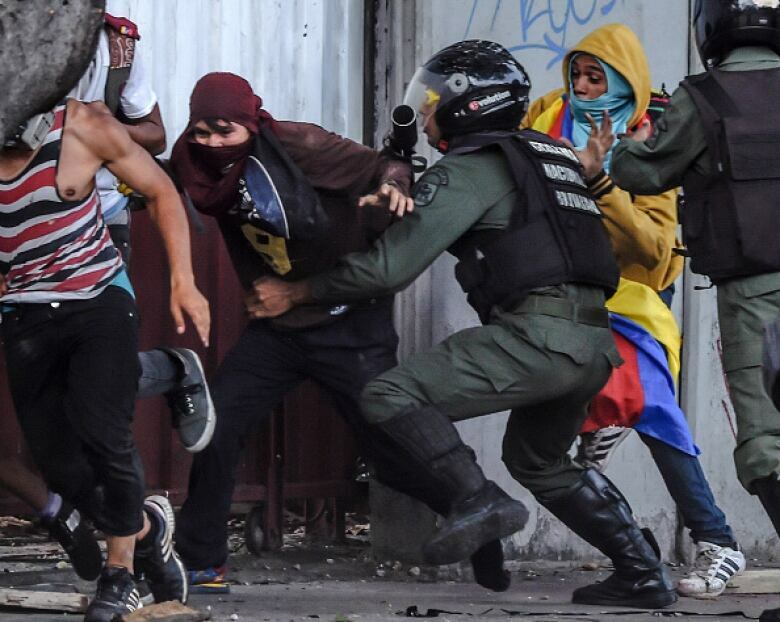 "They've just taken Leopoldo from the house," Lilian Tintori wrote on Twitter. "We don't know where he is or where they're taking him." Allies of former Caracas mayor Antonio Ledezma posted video online of a man who appeared to be the opposition leader being taken by state security as a woman screams for help from neighbours. "They're taking Ledezma!" she cries. "It's a dictatorship!" Lopez was detained three years ago after protests against Maduro's government and sentenced to more than a decade in prison on charges that include inciting protesters to violence. He was released last month to serve the rest of his term under house arrest. Ledezma was also detained in 2015 and has been under house arrest. Venezuela's Supreme Court on Tuesday said the two men have been jailed because they violated the terms of their house arrest. The court said they were removed from their homes after "official intelligence sources" determined there was an "escape plan" involving both men. The court added that Lopez isn't permitted to engage in any sort of political activism and Ledezma is prohibited from speaking to media outlets. The president of Venezuela's opposition-dominated legislature says the allegations are "ridiculous" and the jailings are "absolutely arbitrary." 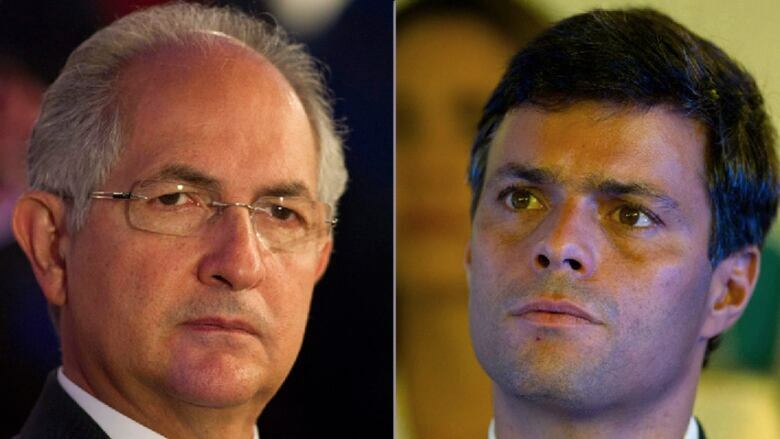 Lopez and Ledezma have recently posted videos online denouncing Maduro's decision to hold a vote for a constitutional assembly with the power to overhaul Venezuela's political system. Supporters of Lopez later released a video he taped a week before state security agents whisked him back to a military prison. It shows the opposition leader calling on Venezuelans to be firm in resisting Maduro. Lopez also announces in the video that his wife is pregnant. The six-minute long clip shows Lopez rubbing his wife's belly and saying he has "one more reason to fight for Venezuela." He calls the pregnancy "the best news I've received in the last 3½ years" — a reference to the time he spent behind bars. UN Secretary General Antonio Guterres is urging all Venezuelans to make all possible efforts to lower tensions, prevent further violence and find avenues for political dialogue. Guterres' message is directed particularly to "those representing powers of the state," UN spokesperson Stephane Dujarric said Tuesday. He said the secretary general believes political negotiations between Venezuela's government and opposition are urgently needed and is convinced "the only way forward is a political solution." Guterres "has taken note" of the judicial system's decision to revoke the house arrest of two opposition leaders, sending them back to prison, Dujarric said. When pressed for the UN chief's reaction, Dujarric said "his overall message is of concern for the increase in political tensions and the country moving away from a path to finding a peaceful solution." Venezuela's defence minister made a televised statement on Tuesday surrounded by the heads of all of the branches of Venezuela's military. During his statement, Padrino Lopez asked for respect for President Nicolas Maduro but remained silent on where the military's alliance is, given Sunday's vote. "We ask for respect for our democracy, for the way in which we have decided to take the road that we ourselves deserve to make in peace, in democracy, with tolerance, without violence and without the road to a coup," he said. The constituent assembly will have the task of rewriting the country's constitution and will have powers above and beyond other state institutions, including the opposition-controlled congress. Maduro has said the new assembly will begin to govern within a week. Among other measures, he said he would use the assembly's powers to bar opposition candidates from running in gubernatorial elections in December unless they sit with his party to negotiate an end to hostilities that have generated four months of protests that have killed at least 120 and wounded nearly 2,000. 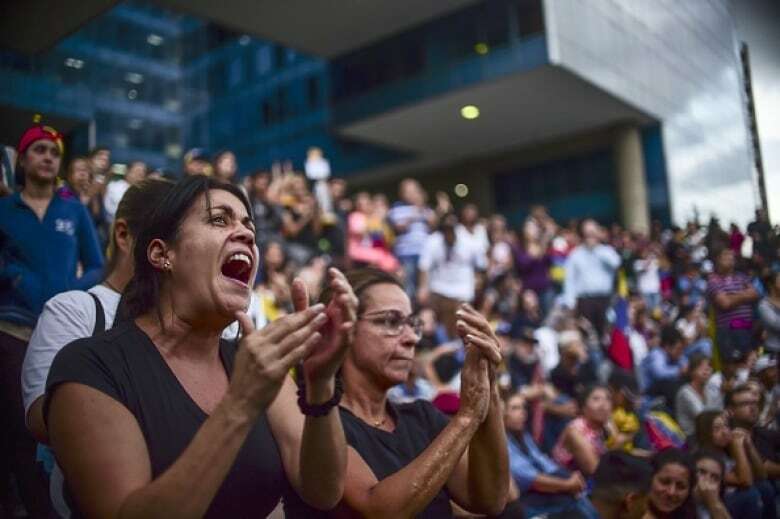 In a possible setback for Maduro, three legislators say they are breaking with the pro-government Great Patriotic Pole party and forming a new faction in opposition to Maduro. Lawmaker Eustoquio Contreras told legislators at the opposition-controlled National Assembly Tuesday that the nation is in crisis and headed toward a civil war that must be avoided. The Great Patriotic Pole is a coalition of 17 parties formed in 2012 to support the re-election of the late President Hugo Chavez, who bequeathed power to Maduro. The legislators say their new faction will be called the "Parliamentary Socialist Bloc." The dissentions are among the highest profile to emerge recently from among pro-government leaders.